Visitation: 4-8 PM Wednesday at the church and 1 hr. prior to funeral service Thursday. Lorraine Aho was born March 4, 1922, in Cokato Township on the farm of her parents, Frank and Jemina (Mattila) Bajari. She grew up and spent most of her life on the Bajari farm. Lorraine attended rural Ojanpera School and graduated from Cokato High School in 1940. After high school, Lorraine worked at the Cokato Hospital. On June 3, 1944, Lorraine married Eino Henry Aho. Lorraine and Eino first lived near Eino’s home, the farm of Charles and Minnie Aho. After a few years, they moved to Lorraine’s home place, the Bajari farm, when Lorraine’s father, Frank Bajari, was nearing retirement and help was needed. Lorraine and Eino raised their family on the Bajari farm in Cokato Township. To this union of 53 years, 6 children were born. The family still farms the Bajari farm. Lorraine and Eino retired in 1984 and moved to Cokato. Eino passed away October 13, 1997. 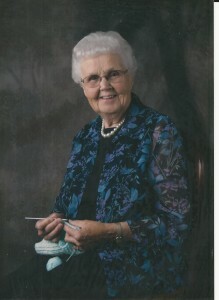 Lorraine enjoyed knitting and quilting. She liked to travel and spend time at the lake. She was active in her church and always welcomed visitors to her home. Faith and family was most important to her. Lorraine passed away at Heritage Place of Cokato on August 19, 2018, reaching the age of 96 years, 5 months, and 15 days. Survivors include her children: Kenneth (Judy), Susan (Risto) Kiviahde, Charles (Jean), Noella (Randy) Herrala, David (Anna), and Daniel (Sarah), along with 41 grandchildren, many great-grandchildren, and sister-in-law Lorraine Wisuri. Preceding her in death are her husband Eino, grandchild Jessica Aho, and brothers and sisters: Mamie Keskey, Clarence Bajari, Daisy Bergstrom, Elma Anderson, Esther Baughman, Benard Bajari, Melvin Bajari, Helen Harris, Elsie Reed.